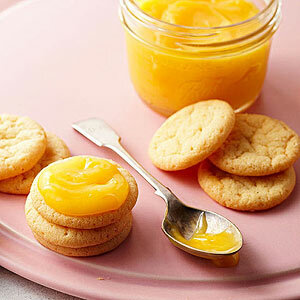 Luscious homemade curd beats the jarred stuff hands-down--and you can customize it with any citrus fruit! Try the curd spread over waffles or toast, layered in a parfait with whipped topping, spread between the layers of a cake or served in a jar alongside simple cookies. Lightly beat the egg yolks in a large glass measuring cup or medium bowl; set aside. In a medium saucepan, stir together sugar and cornstarch. Stir in zest, juice and the water. Cook and stir over medium heat until thickened and bubbly. Stir half of the hot juice mixture into the egg yolks. Return egg mixture to the saucepan. Cook, stirring constantly, over medium heat until mixture comes to a gentle boil. Cook and stir for 2 minutes more. Remove from heat. Add butter pieces, stirring until melted. Cover surface with plastic wrap. Chill for at least 1 hour.